Shivapuri National Park is the ninth national park established in 2002 AD having the area of 144 Kilometer square situated on the northern peripheral of Kathmandu Valley. 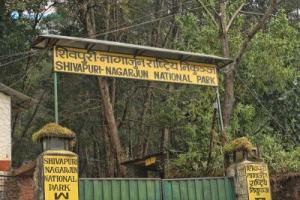 In 2009, Nagarjuna Wildlife Reserve, situated to the north-west side of Kathmandu valley in the area of 15 kilometer square, was combined with Shivapuri National Park which later named as Shivapuri Nagarjun National Park. Now it has spread to the area of four district Kathmandu, Sindhupalchowk, Nuwakot and the newly included Nagarjuna jungle touches the border of Dhading. Eventually, it possesses the area of 159 Kilometer square in total. Shivapuri Nagarjuna National Park is famous for its flora and fauna along with some extinct wild animals it has preserved. Shivapuri is the name of the peak, which has been mentioned in the Skanda Purana’s Nepalmahatmya as the holy abode of Lord Shiv with propitious shivalingas, situated on the very northern top frontier of Kathmandu valley which measures the height of 2732 meter. The name of the park has been given after Shivapuri hill and the Nagarjuna jungle. The climate of the park is the threshold of subtropical and temperate. The temperature during the winter season has been recorded from 2 to 17 degree Celsius and 19 to 30 degree Celsius during the summer season. The species of flora are pine tree, cherry, oaks, rhododendron, Persian silk tree etc. According to the record of botanists, the number tolls 2122 species of flora in this park. The fauna in the park includes Indian leopard, jungle cat, golden jackal, Himalayan black beer, rhesus monkey, wild boar, Hanuman langur, Chinese pangolin, Indian hare, Himalayan squirrel, Monocled cobra, Himalayan keelback, horned frog. Ornithologists have recorded 318 species of fauna which also counts Eurasian eagle-owl, cuckoo dove, and golden throated barbet in the park. The most remarkable benefits it has provided to the people of Kathmandu with 30 million liters of water per day. The area was initially established as the protected watershed and wildlife reserve in 1979 which has now been conserved in the national park. The way to visit to the Shivapuri Nagarjuna National Park varies according to the place you want to visit as one way from Sundarijal. Another is from Budhanilakanth and another is also from Phoolbari Gate of Nagarjuna jungle area. These three ways are more popular and well-known path to visit the national park. The beauty of national park has been heightened by the trekking and hiking routes it offers to the visitors. It has the trekking routes which go to Nagarkot, Gosaikunda and Helembu and Langtang National Park. In the vicinity of Kathmandu valley you experience the nature and its fragrance in your visit to this natural land. Even being very near to the city you enjoy the magnetism of the nature presented by the natural surroundings. If you want to follow the route of Budhanilakanth to visit the national park, you can go on ride up to the village named Bahundada. Otherwise you also can enjoy the hike from the Budhanilakanth Bus stop. Following the path of the town your walk starts to lead you up to the high altitude gradually. After about 2 kilometers of walk you arrive to the area of national park guarded by the Nepal Army. You can see the on the side of the gate which you would cross to move further. There is short cut way also following the trail of the jungle. Moreover, you also can continue your journey through the pitch road. Before reaching to the village situated on the top bottom of the hill, you would pay for the ticket to visit to the national park. There is one point from where you are not allowed to walk. However you can go further through the road if you are on the vehicle. You will be checked by the Nepal Army on duty who would be standing on the way which leads higher to the Shivapuri hill. The higher you reach, the more spectacular view you come to appreciate. It is not only the natural beauty of the jungle, hills, and the mesmerizing sound of the birds and the appearance of some wild animals on the way but also the panoramic landscape of Kathmandu valley appeared from every corner you stop. You would not get tired during you walk because of spell-binding and breath-taking scene and surrounding you undergo. The thickness of the jungle and the appearance of the wild animals make you realize how the country Nepal is. In other word, this the country of nature and natural beauty. You would feel satisfied and content having decided to visit such a pristine land. Even the cosmopolitan city of the nation has been surrounded by the jungle and nature which obviously insinuates the nation is yet to explore in the field of the flora and fauna.